Raw material prices will affect the total cost. Because asphalt features oil as one of its main components, higher oil prices tend to also equal higher asphalt prices. Long-term cost must be carefully considered as well; since concrete can crack, weather and weaken over time, fixing sections of your concrete driveway can end up costing quite a bit more (especially if the concrete is improperly treated during installation). However, asphalt driveways need to be re-sealed every 4-5 years to prevent cracking and breakage, and this short lifespan as compared to concrete could be an issue for some homeowners. If cared for properly, concrete driveways can last up to 50 years before they need to be replaced; asphalt driveways normally last for 20-30 years. 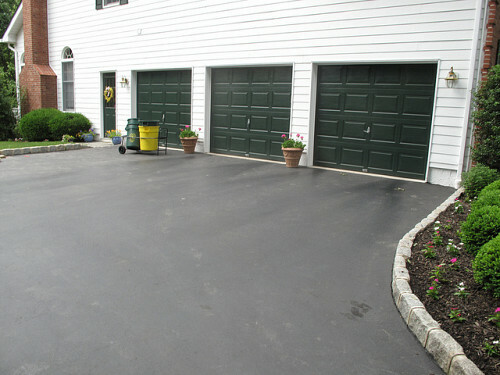 Asphalt driveways also tend to be more maintenance-heavy than concrete driveways; the aforementioned sealing process needs to be repeated regularly, and the sealant will take anywhere from 2-3 days to completely dry. Whether concrete or asphalt is the best choice will also depend on where your home is located. An asphalt driveway will be more resistant to cold temperature extremes, making it more suitable if you live in a place with harsh winters. A concrete driveway will not be as affected by very warm temperatures and direct sunlight. However, in a hot climate, asphalt will heat up and may cause burns on bare feet (in addition to releasing lots of sticky oil onto the top of the driveway, due to the petroleum content); a concrete driveway in a cold climate, meanwhile, will be more susceptible to cracks, stress and related damage due to harsh weather such as rain and snow. Initial installation time. Asphalt driveways usually take 2-3 days to install and are ready for use soon after, while concrete driveways can take 3-4 days, and cannot be driven or parked on for 5-7 days after installation, because concrete needs lengthy curing time. Curb appeal. How the driveway will complement and enhance your home's appearance is also worth thinking over. There is an enormous variety of decorative concrete color and pattern options, but asphalt comes in a much more limited range. Staining. Concrete tends to show stains such as oil much more readily than asphalt does. Repairs. Though both materials are susceptible to cracks or wear and tear, asphalt is easier and less expensive to repair. For the best-looking, longest-wearing driveway of either concrete or asphalt, hire a reliable contractor to handle installation.